Once hailed as heroes by the public for their courageous, boundary-breaking work, it seems that undercover journalists have fallen out of style in recent days. At least, that is, when an undercover journalist tampers with administration-protected, government-funded activity. Of course, the government activity in this case is Planned Parenthood itself—on the take to the tune of $500 million per year in taxpayer dollars. And the undercover journalist in question (or should we say, in the crosshairs) is David Daleiden. Daleiden and his Center for Medical Progress have now released four videos in an ongoing series, chronicling Planned Parenthood’s involvement in the trafficking of fetal body parts, harvested from babies who are being aborted—though as the fourth video indicates, some body parts are being harvested from already-born babies. Since ducking for cover isn’t a viable option for the worldwide leader in abortion, Planned Parenthood CEO Cecile Richards and her PR spin team at SKDKnickerbocker devised a counter-attack. 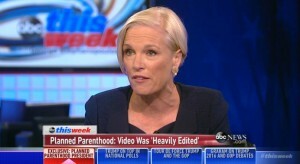 While Planned Parenthood’s response to videos depicting its highest-ranking medical officials bartering for baby parts comes served with a side of unconfirmed claims of a “hack” on its website, its main dish revolves around an attack on Daleiden’s undercover reporting, as well as a full-fledged character assassination of the man himself. The dirt on Daleiden includes “allegations” ranging from an attempt to discredit him based on his authorship of articles for “opposition outlet(s) The Weekly Standard and Human Life Review,” to the much more serious claim Richards herself made on an interview with ABC News. Without as much as a shred of evidence to support her wild accusation—“slander” is the word that comes to mind here—Richards and her organization have repeatedly attempted to tear down Daleiden’s reputation and dismiss the videos as the “highly edited” act of a religious wingnut. As a compliant public, we are to believe Richards’ allegations—not only the flat-out lie that the uncut videos the Center for Medical Progress released were “highly edited,” but Daleiden has some shadowy connection to the murderers who killed abortionists in 2009 and 1998, when he was 20 and 9, respectively. Meanwhile, an injunction issued by the Los Angeles Superior Court has allowed StemExpress a reprieve until an Aug. 19 hearing to decide whether Center for Medical Progress can release more footage capturing conversations with three StemExpress officials. Planned Parenthood’s strategy is to claim that the facts are irrelevant because the guy who filmed them is supposedly a shady character. Admittedly, it’s a novel approach, but it’s also one that won’t work on anyone who’s seen the videos. You can’t unsee the unspeakable reality that is abortion.